Today I did something new with my girls! We went to the YMCA! They had playtime in the supervised kids area and I had uninterrupted workout time in the gym. My husband and I were members of our local YMCA pre-kids, but recently we decided to join again. It’s time for us to get back in shape and we are looking forward to signing Maggie up for swim lessons too! Plus, our local YMCA provides two-hours of child care services a day! How’s that for an incentive to exercise?! Being in a new environment, I was worried with how my girls would adjust to being “dropped” off for some time away from mom. I knew they were in great hands with the ladies that run the childcare program, I guess a part of me just felt guilty. I decided that I would start off with “baby steps” and leave them for small amounts of time. So about 30 minutes into my workout, I decided to check on them. I actually ran into one of the childcare workers in the hallway, she was coming to find me – they had been trying for 15 minutes to get Molly calmed down, she was crying like crazy and nothing they were trying to soothe her was helping. On the other hand, Maggie was having a great time and didn’t want to leave! We ended up leaving and about 10 minutes later, Molly was fast asleep in the car. I guess all that crying wore her out! I’m hoping that after a few more short visits, my girls will be acclimated to their surroundings. I want to continue exercising and I think it’s important for both girls to spend time away from me and around other kids! So…tell me how do help your children adjust to a new environment? I love the YMCA. We were members when we lived in Tampa and I went everyday. I belong to a gym here now and Harlan cried at first and I would have to sneak out. Now that I go regularly she has gotten used to it and actually looks forward to going and playing. 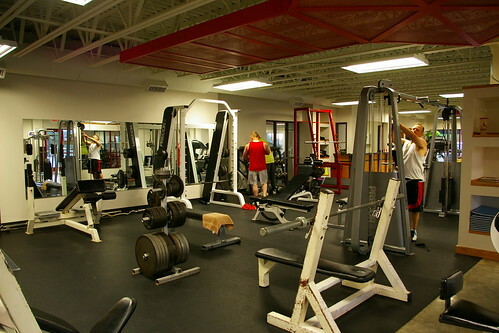 I love our neighborhood YMCA – I can practically walk to it from our house, no excuse not to go! I’m hoping Miss Molly will settle into the idea after a few more, short visits! Maybe I’ll trying sneaking out! 🙂 Maggie seemed to have a great time! We’ve always been lucky in that regard – our children are very good at adjusting themselves to new places. I am a new follower from Follow Me, Chickadee! I’d love it if you came by to follow back. Thanks! Hi Holly – Thanks for stopping by! I appreciate you following along! Poor Molly! She was just missing her Mommy! I bet next time she will get used to those sweet ladies and have fun! We used to belong to the Y here and Campbell stayed in their childcare quite a few times. It was tough for the first few visits, but she quickly got used to it. And as they age, they’ll go through different levels of security comfort. Maggie might be fine now, but she may go through a separation anxiety phase. And Molly may grow right out of hers! Good for you guys for finding some “you” time! Thanks, Kimi! I’m hoping that after a few more short visits everyone will be happy! 🙂 I’m excited to get back in the swing of exercising and having “me” time too! I love the YMCA. It has excellent programs for kids, and provides an opportunity for them to make new friends and get comfortable with their new surroundings. Glad you are an advocate!